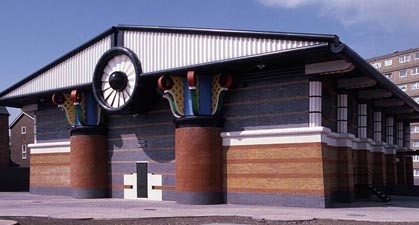 When John Outram was given the opportunity to design a building to accommodate pumping equipment and computer plant to return surface water to the river Thames he created not a basic industrial fabrication but a truly classical and enduring design subsequently christened the “Temple of Storms”. Public access is denied, the building is visited only once a week for maintenance and because of the flood protection it provides to areas of London ,security against vandalism is of vital importance. Ketley Staffs Blue Class A bricks are used for the transformer building and the lower, most vulnerable part of the main walls of the station. 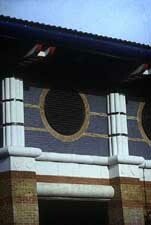 The perimeter wall is constructed from Ketley Brown Brindle Class A bricks.